WW1 Reenactments Equipment : Great War Tommy WW1 Food Rations Labels : Caleys Chocolate bar wrapper. 1915. WW1 Reproductions and WW1 Reenactors Equipment / Kit - Caleys Chocolate bar wrapper. 1915. 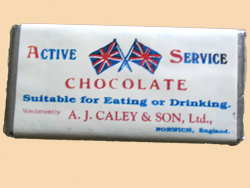 "Caley's" Chocolate bar wrapper. 1915. Overwrap for "Active Service" chocolate by A.J. Caley & Son, Ltd., (1883) of Norwich, England. Manufacturers of the famous "Marching" Chocolate. Caley's also produced a Cocoa Paste Emergency Ration for the Military.